The links above have all three sheets pictured. 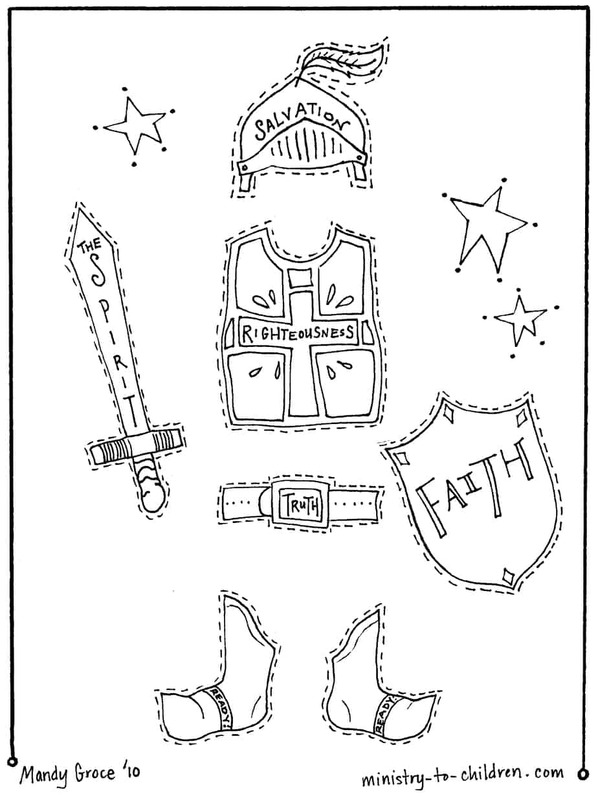 These original Armor of God coloring pages are based on Ephesians 6:10-18. They were created by Mandy Groce, please leave a comment to encourage her ministry. Directions: To use these printable Armor of God coloring pages in your ministry, school, or home – simply click above download as a printer friendly PDF file. If you prefer working with large JPEG image, simply select the files below. There are two versions of the coloring page – one picturing a boy and the other picturing a girl. The children have the phrase “strong and courageous” written on their t-shirts. The third sheet is the pieces of the full armor of God. You can have the children cut and paste those pieces to construct the final picture. These coloring pages would be a perfect craft project for your Armor of God Sunday School lesson. As you teach about each piece, you could have the children attach it to their picture. Download our complete free Vacation Bible School curriculum based on the Armor of God. Thank you so much for making this VBS material free to us in small churches. We’re holding our first VBS in August 2015 and I’m so excited. Your how to prepare article was so helpful. We’re studying to prepare ourselves for the children who will come. Please pray that our efforts will be successful as we reach out to the children in our community. My desire is to draw them into God’s house and expose them to the Word of God before the world corrupts them. Please pray for us. Thank you again for unselfishly giving of yourself and sharing your materials. God bless you. 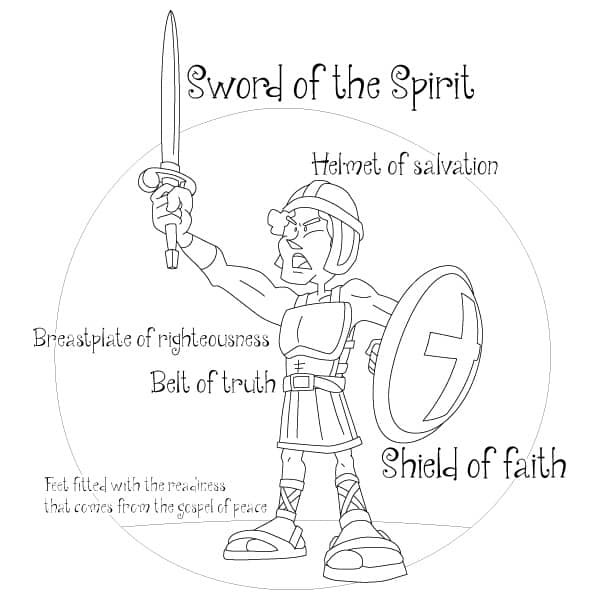 I’d like to use your Armor of God colouring pages to complement a kids message on that text from Ephesians. I’ll be preaching on it to the adults, and the youth are participating in the service, demonstrating with baseball gear the importance of protective equipment. Then I’ll give the handouts you made to the children for Sunday school or home – we’re just a little rural church in Ontario – less than a dozen Sunday school age kids. I really like that you’ve brought together the tactile – cut and paste – piece alongside the intellectual – the verses and equipment, all tied back to the command to be strong and stand firm. Great work for the Kingdom! Hi Mandy – I’m using your artwork at our local homeschool co-op group where I will be teaching about the armor of God! Hello Gracie,I have been using this website for my children’s church lesson plans and I have enjoyed everything so far!!! So glad to start” God’s Amor” tomorrow for Sunday morning children’s church! The art work is awesome! I love these and I love this site! I am super excited to incorporate the lessons and these great illustrations into our homeschool setting! I homeschool my daughters and we have a time for bible study. I think this is a great visual tool for them to use. I am using it for “Back To School” sunday school lesson. Thank you! We are using your art work with our Sunday School lessons. We will be using the coloring pages as part of our Back to School lesson. Thank you!! I’m using these for a Back to School summer Sunday school lesson for our church’s children. Thank you so much for these wonderful free resources; they are very much appreciated!!! Thank you so much for sharing your gifts with my Sunday School class. We are a small church, and our resources are limited. The children in my class (K, 1st, 2nd, and 3rd) love your lessons and art. You are a blessing to us! We really appreciate your willingness to share the love of Jesus with us! Thank you! I think we are going to work through these lessons and also practice putting on our armor in the mirror in the mornings. Love your drawings! These lessons w/ coloring pages and crafts are a huge help to us in our AWANA program. They are well done, very Scriptural and we really appreciate you sharing them with us. Thank you for sharing these with everyone. I will be using these with my children for our homeschool study of the armor of God. We are finishing up the Armor of God lessons tonight in the children’s department at my church. They were all terrific. The content was rich with God’s word and the explanations on how to make each piece of armor was easy and kid friendly. Teachers and kids both loved them. We also loved the song and the sign language to help us remember the memory verse. Please continue to share your ideas. I love teaching children but I am not creative. This is the perfect craft activity for 3rd graders to use in my Bible lesson! My students will love coloring, but will remember the spiritual weapons from this creation! Thanks so much for providing this free material. I look forward to using these wonderful pictures to teach such an Important message! Thank you and God Bless! Teaching this lesson next month in Sunday School for grades K-3. Thank you! We will use them for our VBS program. After discussion, we will have children paste the correct pieces to the boy/girl. Thank you for sharing these! I’ll hand them out to children during our Children’s Message about the Armor of God this Sunday. Thank you so much Mandy for these wonderful drawings which I will use with the lesson on Ephesians 6. They will be a great way of the children understanding about putting their armour on each morning. So pleased to have found this wonderful lesson and printouts. May God bless you in your work. I run an After-School program with The Salvation Army. I will be using your activity as a part of our Devotional. Thank you very much for sharing these printouts with us! I will be using them with the Sparks club at our church’s Awana program. Our Sparks club is made up of 40 clubbers and on Sunday they are going to be learning about The Armor of God. These pages are perfect to include with the lesson. I Love your idea for The Armor of God. So hard to find a way for pre-schoolers to connect with lesson when they cant yet read. It was like playing paper dolls.. they colored and decorated placed the armor where it belonged on their cut out person and talked about why and what every piece of armor iwas for. Thank you! We had so much fun, I live in a small Mt. community of only 2,400 people and our congregation is only about 90. Helps so much people like yourself post these wonderfully helpful ideas promoting Gods word and love for free. I used The Armor of God activity for children to colour during a sermon/presentation on Halloween where I challenged the children to dress not in Halloween outfits, but in the Armour of God. This is absolutely wonderful. I love the pages and the lesson plan. Hi, in the UK. Thank you for your resource and for making it free. I’m using it with kids 4-8 years for Sunday Club tomorrow. God bless you for your heart, this is helpful to so many. Loved this activity, the kids really enjoyed the challenge of cutting out the armour and pasting in the right places. Thank you for creating it. Tony Kummer (Editor) reviewed & updated this page on : April 6, 2019 at 9:26 am. All our content is peer reviewed by our readers, simply leave a comment on any post suggest an update.